This is just the first exciting artist announcement with more coming your way over the next several months. Stay tuned for updates about RV Tickets, VIP Upgrades, Red Barn Late Nights, and much more! Early Bird 3-Day GA Ticket Pricing Extended! With all the excitement about Summer Camp 2019, we’ve just sold out of Early Bird tickets. But have no fear! We want to make sure everyone has one last chance to get Early Bird tickets before Christmas. So, we’ve decided to extend Early Bird Pricing through 11:59PM on Christmas Eve! Tickets are on sale online at www.summercampfestival.com/tickets or by phone at 1-800-514-ETIX. 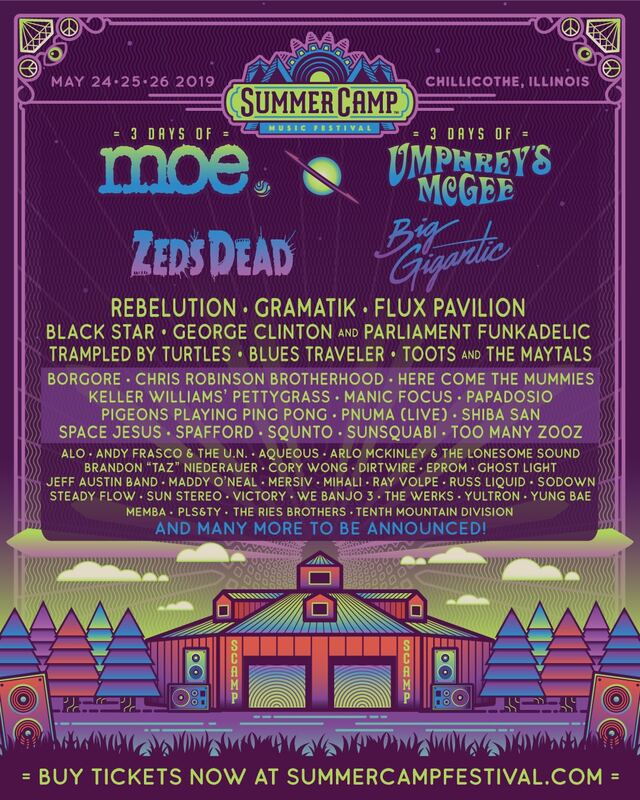 Summer Camp Music Festival 2019 will feature over 180 artists on 9 stages including 3 days of moe. and 3 days of Umphrey’s McGee. On top of all the live music, festival-goers have access to on-site camping, late night shows, musician workshops, a non-profit village, unique arts & craft vendors and tons of great food and beer. The Summer Camp Music Festival started in 2001. Since its beginning, Summer Camp has been known for its spacious, open fields for shows, trademark late-night events, pristine campgrounds, and amazing lineup of eclectic artists and bands. 2019 will mark the 19th year of the festival which has hosted a wide array of talent over the years, including: Umphrey’s McGee, moe., Trey Anastasio Band, Primus, Tom Petty’s Mudcrutch, Phil Lesh & The Terrapin Family Band, Bassnectar, Zac Brown Band, Steve Miller Band, Big Grizmatic, Jane’s Addiction, Diplo, The Roots, Widespread Panic, The Flaming Lips, Cypress Hill, Willie Nelson, STS9, Jason Isbell, Pretty Lights, The Avett Brothers, Excision, George Clinton, Skrillex, Zeds Dead, Violent Femmes, and many, many more! Produced by Jay Goldberg Events & Entertainment.